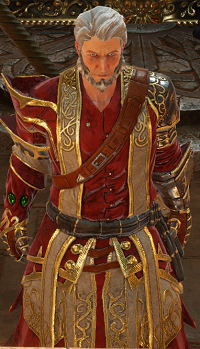 High Judge Orivand is an NPC in Divinity: Original Sin 2. High Judge Orivand is a willful leader of the Magisters who strongly believed in containing Sourcerers and removing their source to protect the realm of Rivellon. Orivand is wields a great mace that allows him to carry out his verdicts with justice in mind. However, while his goals may be noble his methods are widely thought as cruel and horrible. He possesses some sort of wand that is able to drain the source from a Sourcerer rendering them powerless. At the same time manipulating their souls to become silent monks, or servants of the Magisters with no free will. These monks can be encountered throughout the main keep of Fort Joy and are passive unless attacked. High Judge Orivand first appears in Fort Joy, he is found sentencing a woman as the player interrupts, dialogue will commence that will then initiate combat. High Judge Orivand will not take damage prior to entering dialogue and purging the prisoner. It is recommended that you do not kill High Judge Orivand before escaping with the Black Cat. If you return to him with the cat familiar and speak with him, the Summon Cat Familiar skill will be upgraded. NOTE: This information is only a rumor and completely unverified. Left here for posterity, but general concensus seems to be there is actually not a way to accomplish this in the release version of the game. Ok, I&apos;ve tried different things now and whenever I reach the room where Orivand is sentencing the woman, there is no dialogue, I enter, a guard sees me, yells at me and the fight starts. My problem is: Where is the dialogue with Orivand, I remember having a entire conversation with him before he transformed the woman into a zombie and then fight him. It may be something small and irrelevant to the progression of the game, but I really liked that sequence, I don&apos;t know what I&apos;m doing different with this playthroughs but the fight starts immediately. Anyone knows why is that? PS: I still have my collar and have not left the prison yet. can sombody tell me how the black cat familiar upgrade works? in the notes stands that &apos;&apos;the cat will express gratitude for reuniting it with its previous owner and upgrade the Swap Places skill, allowing it to swap places with any member of your party&apos;&apos; but everytime when i use the skill and enter the room, nothing happens. same when i enter the room and the dialoge starts, nothing happens. after that the fight begins and i summon the cat and still nothing happend. the prisoner cannot be saved. i teleported him out of line of sight (stealth close to him to the next room behind 2 walls..) before combat started. and the second combat started (before anyone started playing) , the prisoner was converted. I killed him and he dropped a severed arm, but eating it (elf) gave me no memories. Bug? Killed him today. Dropped his big mace but not the wand - pity, i was hoping to turn magisters..